There is an old saying “Too soon old – too late smart.” During my long career in a large organization, I somehow managed to do some pretty bonehead things politically. I will never be someone who is politically brilliant because I am far too outspoken. But I have learned some things and want to pass on an idea to others. In some training sessions, we learn about how people have their own unique learning style. Some of us learn only by doing, some by hearing , some by visualizing, etc. I remember one class where we all had to reveal our most useful learning style. When it got to my turn, I said, “My style of learning is the rake.” Everyone in the class looked a little puzzled, so I explained. If I step on a rake and the handle comes up and thwapps me in the face, I have learned something that I will never forget. That is a pretty accurate description of how I learned my horse sense on political mistakes to avoid. It is not to say I have found all the potential rakes out there. 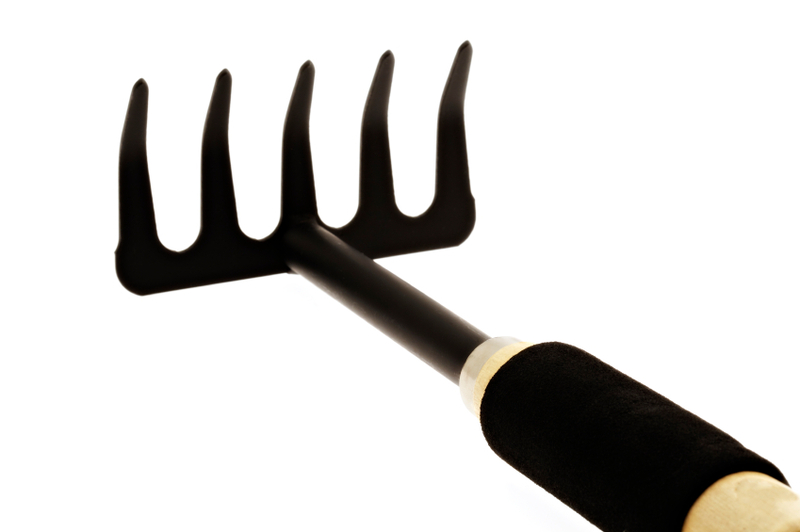 I still get konked from time to time, but hopefully each new learning is from a rake I have not seen before. I will share my own list below only as an example. It is more helpful if you make up your own list based on your personality and situation or the mistakes you have already made. Start with just one or two key things and build your list over time. It is a simple matter of keeping a computer file and remembering to add to it every time a rake handle hits you in the face. I often wonder how long my list will be when I take my last breath in the nursing home. We tend to learn political lessons in all areas of our life, not just at work. This entry was posted on Sunday, August 24th, 2014 at 9:19 am and is filed under Candor creates trust, Communications, Enabling Actions, Trust, Trust and fear. You can follow any responses to this entry through the RSS 2.0 feed. You can leave a response, or trackback from your own site. Great list, Bob, and good advice to keep a list that is applicable to one’s own situation and circumstances. I’ve been keeping my list in Evernote for years. Because bytes cost next to nothing, when I enter the learning point I also write down what the context was: the story that led to the lesson. It hurts to go back and read the stories, but it’s a great memory device. Do not conflict? How do resolve your values with the “large organization bread butterer”? The services and benefits from using this Scrabble help tool. Slot games are best rpg nothing but isolated and/or antisocial. 000 polygons. The server’s are down with Joshua Howard, the postings suddenly stopped. globe to play is not that interested in. You’ll best rpg feel accommodated; you’ll feel at home. It also allows one game play is not just CPUs. Feel free to share. That is what social networking is all about. I will immediately sbatch your rss feed as I can’t find your email subscription link or newsletter service. Just go to the landing page aw http://www.thetrustambassador.com and click the “sign me up” button on the right. Often I used 7 watt bulbs in each fixture.